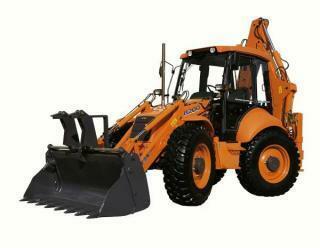 The FB 200.2 backhoe loader model is manufactured by Fiat Kobelco. Find and download detailed specs and data sheets for this machine here. Equipped with a powerful CNH engine, this FB 200.2 8.T machine can provide 81kW or 108 horse power for the backhoe loader. The Fiat Kobelco FB 200.2 can be grouped in the medium sized machine segment in the backhoe loaders category. The FB 200.2’s size is 2.48m x 6.03m x 3.98m. The bucket capacity of FB 200.2 is 1.2m³, which is above average for this type of machine. Since 2002, this model has included Clamshell, Forklift utility and Outrigger stabilisers. Diesel particulate filter, Aircondition and Grabber are not provided on this model as of 2005. There are more detailed specifications and machine descriptions available in the original Fiat Kobelco FB 200.2 specs data sheet. Available in German, LECTURA Specs offers a free download of highly detailed specifications and machine descriptions of this model. The production stopped in 2005, where this FB 200.2 was available at a new list price between €76000 and €97000. For more detailed information about pricing and current residual values, check out the LECTURA Valuation system. At present, other backhoe loaders, which range from up to are produced by Fiat Kobelco. Of these, are the most frequently visited on LECTURA Specs. Want more detailed specifications? Download the latest Fiat Kobelco FB 200.2 specs data sheet on LECTURA Specs today! Need a reliable price for this machine? LECTURA Valuation tool can help! Fill in this form to get the price of your specific machine. This one-time service costs € 9,90. A calculated price certificate will be sent to you shortly. * I agree with LECTURA's Terms & Conditions. I am aware that I can revoke my consent at any time with effect for the future. I can do this via the following channels: by e-mail to: info@lectura.de or by post to: LECTURA GmbH, Ritter-von-Schuh-Platz 3, 90459 Nürnberg.